Guacamole is typically considered a side dish or even just a sauce, but on National Guacamole Day we elevate this tasty green blend into the spotlight. Guacamole (or guac for short) is made of avocados, which are well-known for their health benefits due to their high vitamin content and lots of those healthy fats that help to lower cholesterol. Avocados, native to Mexico and Central America, grow on trees and are technically considered a fruit. But in modern times, the humble avocado has traveled world-wide, and people as far away as Sri Lanka enjoy their own unique version of the guacamole mash-up. Closer to home, people often like to spice up their guacamole with onion, garlic, cumin, tomato, cilantro, or even just some store-bought salsa. There are hundreds of ways to mix up a bowl of guacamole, and people’s personal tastes for this green stuff are just as varied. Traditionally, guacamole is served with tortilla chips, but it’s also good with regular corn chips, carrot sticks (or celery), and even on sandwiches, salads, or hamburgers. Some people even blend it into smoothies! However you like your guacamole, break out a big bowl of it and start dipping on September 16. 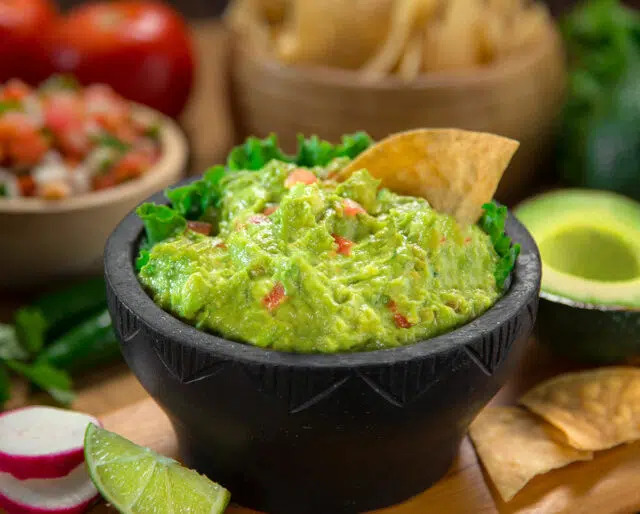 The Aztecs make a spread with avocados called "ahuaca-mulli" or "avocado sauce"
You can really get into the celebratory spirit of National Guacamole Day by actually making it at home yourself. There are tons of great recipes for guacamole, and you can pick one that is as complicated or simple as your cook-at-home comfort level allows. Select some ripe avocados at the store by squeezing each one gently. Ripe avocados will yield to gentle pressure. Bring home your avocados and cut them open, remove the stones, and spoon them into a bowl. Smash with a fork or handheld mixer, and stir in some onion or a splash of salsa for extra flavor. There are probably some great restaurants near you that offer guacamole, so find restaurants in your area for a guacamole extravaganza. Then hook up with some friends and tour your town, guacamole style. Try to visit at least three restaurants on National Guacamole Day, and try out the guac at each place to decide which one you like best. For some added festivity, see if your friends can all agree where the best guacamole came from, and finish off your guacamole tour with an encore at the winning establishment. Whether you made some fresh or brought home guacamole from the store, you can celebrate National Guacamole Day simply my eating some guac. But why stop there? Guacamole has been a source of inspiration for fusion cuisine the world over, and National Guacamole Day is your time to get creative. Whatever you were planning to make for dinner, see if you can find room to add a little guacamole to the meal. Dollop some guacamole onto your chicken, spread it on your burger bun, or try something truly crazy like some guac mac-and-cheese. Whether you like it plain or spicy, guacamole is one of those foods that's easy to love. The avocado is rich in the good kinds of fats that help reduce cholesterol, and when it's mashed the texture is creamy and the flavor has some delicate silvery notes to it. The simplest guacamole is just mashed avocado and a bit of salt, but most people prefer it with some extra flavors mixed in. Onion and tomato are common components, as well as other flavorful ingredients like cumin and cilantro. Guacamole is tasty, nutritious, and easy to make, and it's even easier to bring home ready-made from the store. Guacamole originated as a Mexican side dish, but it certainly didn't stay that way. Due to the health benefits and outright tastiness of this green dipping sauce, guacamole has grown in popularity throughout the world, especially in the United States and Canada. And we've started to play with guacamole fusion. Now it isn't just for tortilla chips and tacos. We use it for vegetables, on salads, as sandwich spread, and even on pizza. Okay, so a lot of us probably don't need a reason to eat guacamole (aside from how tasty it is). But most of us still associate guacamole with Mexican cuisine, and though there are a ton of innovative ways to incorporate guacamole into other types of food, we don't tend to actually try those fusions at home. But whether you like classic guacamole and chips or you've developed an obsession with the turkey and guacamole croissant sandwich, National Guacamole Day is a great reason to include this healthy, high-vitamin food in your diet.